Valentines Day will be here soon! 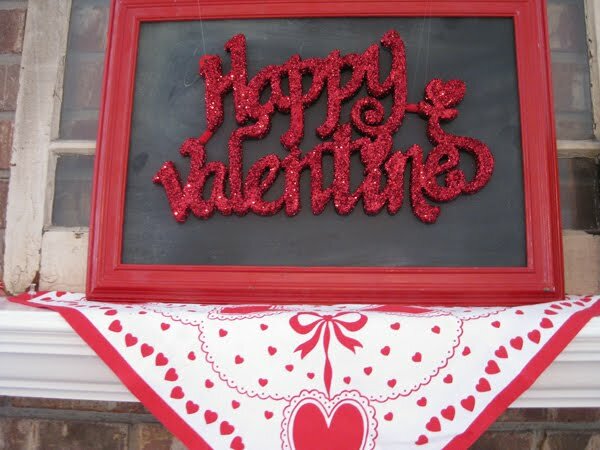 I know I'm a little early, but I love decorating for Valentines Day. I did things a little different this year. 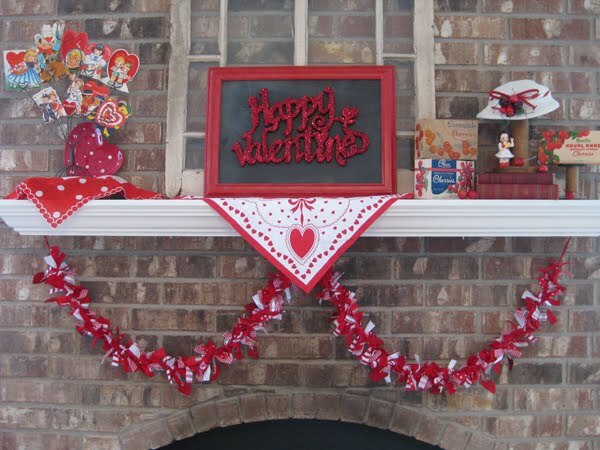 I've never decorated my mantle for VD. I found the red picture frame at the thrift store and did a chalkboard paint backing. Found the thrifted V.D. sign and glittered it. What a mess that was! I decided to do a little cherry vignette. I don't know why, but cherries remind me of Valentines Day. I've had the vintage hat in my craft room and the little figurine and put it together. Here's my little collection of vintage valentines. I like to use scarves and hankies-this was a thrifted scarf. I pick up any with polka dots-doesn't matter what color. You never know when you might need one! Here it is altogether. I found the cute heart garland from Michaels-probably could be made easily from ribbons. I'll share my entryway next time. It's really cold here and dreary. I'm gonna nest and do some embroidery and watch some football this weekend. How about you? It's just wonderful! 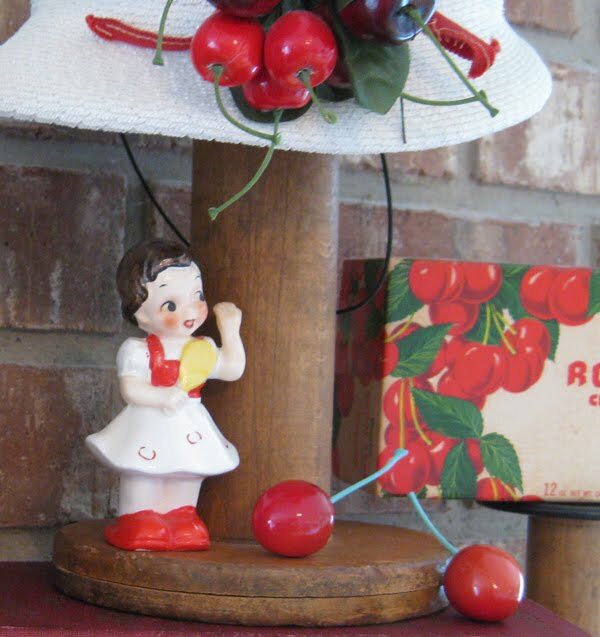 The cherry vignette is scruptious and definitely looks Valentiney to me. Now you will be decorating your mantle for every holiday. My son talked me into hitting two of our local flea markets today. (twisted my arm, he did) ;-) I came home with 5 vintage children's Valentines. I don't have access to a scanner right now so I'll have to photograph them to post soon. Those cherry boxes are to die for. I would never think of that. 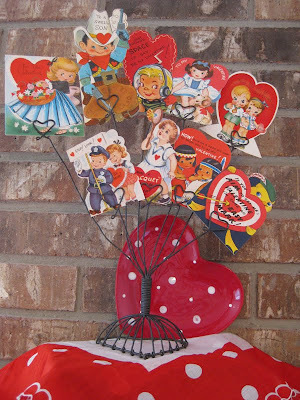 Just a lovely look at vintage Valentine fun. That is ADORABLE!!!!! I love it!!! 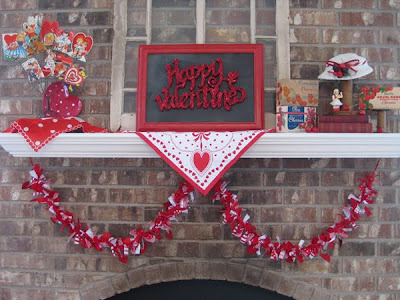 Okay..I have never ever decorated for Valentine's Day...but your beautiful mantle is very inspiring!!!! hmmm. :) Have a beautiful eveninig!!! Such Valentine lovelies! You've really got it together! Happy Happy It's Nearly Here Valentine's Day! 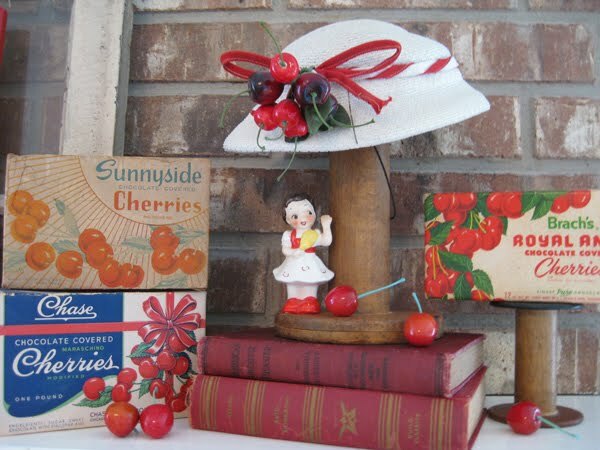 Ooh...I love those vintage cherry boxes!!! I've seen a couple at antique stores and they were pricey. I can see that you really like the upcoming holiday! Hubby and I are going to a concert to celebrate. :o) I'm excited but I think he is less than thrilled and just going to make me happy. Oh well, guess thats marriage...give and take!